When consumers buy a jug of water, a bottle of juice, or a carton of milk, they never think how the product got into its container. As packaging experts know, a vast amount of technology and engineering is required to fill so many different styles and types of containers. The right machines for an operation will speed up production and increase efficiency while reducing or eliminating spillage and waste. Packaging machines are very cost-effective, allowing a company to reduce its labor force while getting more work done. Accurate and speedy filling can only be achieved by using filling machines designed specifically for the job. Liquid filler machines let a company fill between 2,000-9,000 containers per hour, depending on the type of machine used and the specifications of a particular operation. While some machines can handle a viscosity range (from liquids to pastes), others may be designed to specifically handle one type of material, such as only free-flowing liquids. Different types of filling systems may be better suited for certain types of filling materials and containers. Piston filling machines are some of the oldest filling systems still in use. The mechanism it uses is fairly simple: a piston draws the product into its cylinder with suction, a rotary valve switches the openings so the nozzle is open instead of the hopper, and then the piston presses its contents directly into the container. Piston filling machines are best used for viscous products, such as pastes, heavy sauces, and creams. While the system is cost-effective and fairly easy to understand, it is poorly suited for thin products, which can more easily leak out and interfere with the accuracy of the fill. There is also a finite volume range that a piston is able to fill. While other filling systems will be better suited for dealing with more extreme differences in container size, this isn’t a problem if the containers you work with are similar sizes. Servo pump filling machines are more expensive than piston filling machines, but extremely versatile. It can fill nearly any type of material that can be pumped, from water to oil to chunky salsa. Each nozzle has a dedicated pump, so the machine can be programmed to fill different volumes as well. Pump filling machines are typically more expensive and require more technical maintenance, however, for operations that work with a diverse range of materials and container sizes, they are a natural choice and provide excellent value for their adaptability. Time gravity filling machines are used for thin liquids, particularly water, chemicals, inks, paint, and other non-foaming or low-foaming liquids. These machines ensure that a specified amount of liquid product is flowing through the fluid path for a set period of time. For each nozzle, there is a valve that pumps liquid from the main holding tank. Each valve is independently controlled and corrects itself for variations in flow rate, allowing for consistently accurate results. 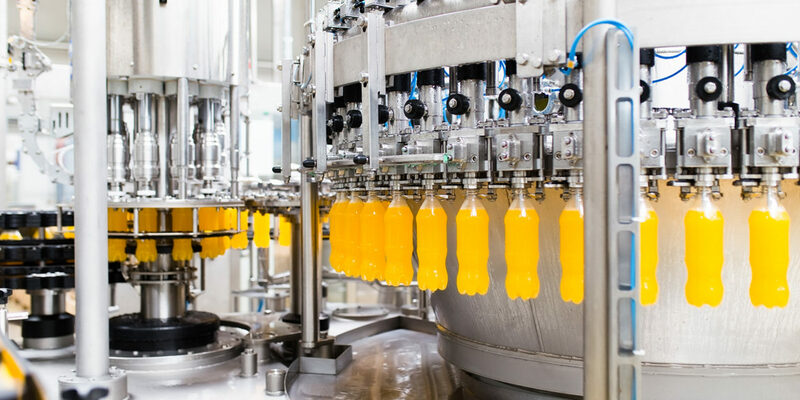 However, because of this automatic compensation, gravity filling machines typically require more operator adjusting than other types of machines. Overall, time gravity fillers are some of the most economical options for water filling machines. Also known as “fill to level” fillers, overflow filling machines are some of the most widely used fillers for small bottle operations. Overflow fillers fill to a target height rather than for a particular volume. Although, as long as container sizes remain the same, volume should also match. It is ideal for free flowing to medium viscosity liquids. These include water, dairy products, soaps, motor oil, and cleaning fluids. When it comes to liquid and beverage bottling equipment, one machine may not work with all applications. Based on a products thickness or ingredients, some filling systems may be better suited for the job than others. No matter what liquid products a company packages, Velocity can help you find or fabricate the best filling solution. This entry was posted in General News and tagged featured. Bookmark the permalink.